Global Scientific Research Journal of Plastic Surgery and Modern Techniques is a scientific journal which covers high quality of manuscripts which are both relevant and applicable to the broad field of applied Plastic Surgery. Journal renders novel, clear connection to Surgery requirements and Reconstructive surgery by the perceived palatability of Reconstructive Surgery and their applications in highly interdisciplinary applied sciences. The Journal aims to reflect contemporary thinking so that professionals can keep pace with the developments in the field of Plastic Surgery and Modern Techniques. 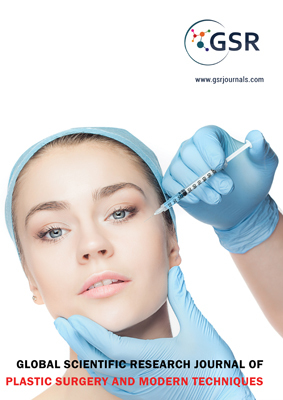 Global Scientific Research Journal of Plastic Surgery and Modern Techniques is a scholarly journal and expects to distribute most finish and solid wellspring of data on the revelations and current improvements in the method of original articles, review articles, case reports, short communications, etc. in every aspect of the field and making them freely accessible through online with no confinements or whatever other memberships to specialists around the world.